In 1981, Alvin Schwartz unleashed his horror classic Scary Stories to Tell in the Dark upon the world, and it and its twosequels would scar psyches for generations to come. 1984 saw the release ofIn a Dark, Dark Room, a similar book that Schwartz had tailored to somewhat younger readers. Unlike the Scary Stories books, though, this one never got a sequel...or did it? 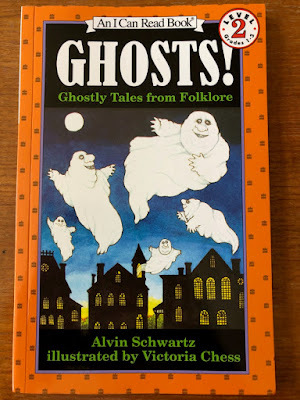 Ghosts!, published in 1991, is an oft-overlooked installment in Alvin Schwartz's oeuvre that serves in many ways as a spiritual successor to In a Dark, Dark Room. In belongs to the somewhat redundantly named "I Can Read" book series, like Dark Room, so it is targeted at a similarly young audience, and of course it shares the supernatural theme of the aforementioned works. But how does this one stack up against the veritable murderer's row of Schwartz's earlier classics? Let's find out.